Currently on show at Mori Art Museum and The National Art Center Tokyo, “Sunshower: Contemporary Art from Southeast Asia 1980s to Now” is so far the biggest Southeast Asian contemporary art exhibition in Japan. It includes participation by 86 artists or groups and four young curators from the region, with the assistance of curators from both museums. It showcases a staggering number of artworks, from videos to multimedia and installation pieces. The title is taken from a frequent Southeast Asian meteorological phenomenon in which sunshine and rain occur at the same time. According to the exhibition outline, this is a metaphor for the consequentially ambiguous changes the region continues to experience, from its colonial past up to its ongoing economic advancement and urban development. But what exactly is Southeast Asian contemporary art? Why does this exhibition matter? To answer the questions above, the curators divided the exhibition into nine sections for the nine founding member countries of the Association of Southeast Asian Nations (ASEAN). However, rather than representing each nation, these nine segments discuss different contemporary issues facing the subcontinent. With their diverse perspectives and ingenious approaches to contemporary practice, each artist describes the region’s dilemmatic changes and how they affect their lives. For instance, Sutthirat Supaparinya, an artist from Thailand known for her socially conscious video works, illustrates a development in her grandparent’s hometown along the Ping River. In her two-channel video My Grandpa’s Route Has Forever Been Blocked in the “Growth and Loss” section, she shows her grandfather recalling the river that once existed before a mega-dam project. The river has disappeared and what is left are now just memories. To the technocrats, however, this project represents a leap towards the future. The paradox of developmental progress discussed in “Growth and Loss” resonates with the “Dialogue With History” segment. By investigating linear historical narratives of progress, these artists portray history outside of mainstream depictions. For instance, the Cambodian artist-photographer Vandy Rattana uncovered unknown history from the Vietnam War during a search for personal family memories. 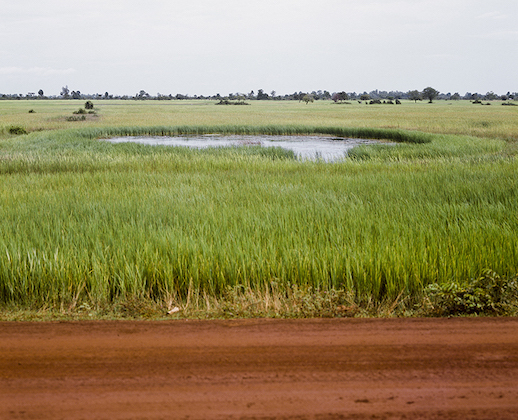 This discovery would lead him to create a series of photographs he would call “bomb ponds.” Rattana’s incidental discovery of bomb-forged ponds hidden and forgotten in the idyllic Cambodian landscape reveals scars left by U.S. bomber planes. Although this piece of history was many years distant from him, Rattana chose to frame it not objectively but rather poetically, re-imagining it as a personal memory reflected in his own contemporary reality. Contemporary art in the Southeast Asian region not only points to the societal uncertainty of economic “progress,” it illuminates the vulnerability of a region with resources powerful international players still contend to exploit. 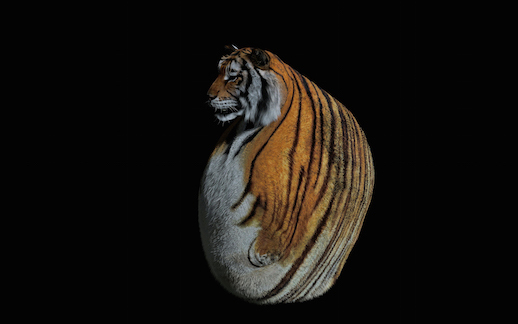 This vulnerability is seen in works by the Singaporean media artist Ho Tzu Nyen, who explores such issues in his CGI animation of a Malay tiger morphing into a British colonialist. In Southeast Asian mythology, tigers are a co-species that play an important role as a medium between the living and the ancestor-spirit world. Now that Malay tigers have gone extinct in the wake of colonial modernity, the beast is reduced into a mere symbol, its importance in mediating the cohabitational life of man and nature eliminated. Today, the representation of Southeast Asia in the global economy is that of a tiger – a subdued beast that has lost its capacity as a liminal figure to shape encounters with otherness. Ethnographer Anna Lowenhaupt-Tsing’s concept of “contaminated diversity” describes the shifting identity of people living in precarious conditions and the necessity of collaborative survival. This relationship is exactly how tigers and humans once co-existed in a shared habitat, where they “contaminated” each other and survived together. Moreover, this peculiar strength of Southeast Asia has enriched its culture and allowed for its development before and after colonialism. However, the precarious contemporary situation makes these societies once again vulnerable to more exploitation. In fact, through bilateral trade agreements, powerful nation-states are currently preying on the same vulnerabilities. There are many questions that arise from this exhibition, one a geopolitical issue of why hold it in Japan, a country far from the show’s focus. Does the distance allow us to see this place better? However you come down on this question, though, Sunshower does effectively profile Southeast Asia as a vulnerable resource and market for neocolonial advantage, a situation reflected in progressive contemporary art practices. Let this exhibition be your gateway to a more empathic understanding of the region, a place where tigers and man once thrived together.